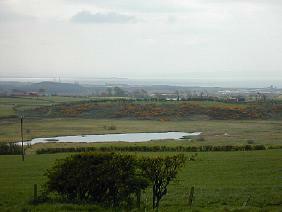 This medium sized loch lies in a hollow (NS 275 443) in pastoral land km north of Stevenston. The network of byways which surround the loch require some map reading skills and none approach closely. Excellent viewing over the area by telescope can be had, however, from the car park at Lochwood Farm Steading (NS 273 448), on the byway which passes to the north, but please respect the wishes of the owners. The byways are suitable for cyclists but the nearest public transport is a fair walk away at Kilwinning or Stevenston. One approach by car is: From A78 north from Irvine, turn right at the Hawkhill roundabout at the end of the dual carriageway along A738 signed Kilwinning. In 0.4km, first left, then in 1km right at crossroads in the outskirts of Stevenston. Follow this byway round for 2.5km to the Steading at the top of a rise overlooking the loch. Park at farm steading, use telescope. Good network of quiet by-ways. The loch is in a Site of Special Scientific Interest. The reed beds around the loch are good for Water Rail , Sedge Warbler and Reed Bunting . The loch has a range of waterfowl, especially in winter. Interesting sightings have included Marsh Harrier , Quail and Garganey . The Steading is a highly-rated farm guest house and is part of a working farm. There is also self-catering accommodation. Although the car park is really for visitors, the farmer is keen to encourage an interest in wildlife and farming practices. He may, on request, permit an approach to parts of the lochside on his land.